In the 1950’s and 60’s the summer was a wonderful time for a child to play. Boys played the “Roly Poly” baseball game in the street. Most homes did not have air conditioning. Some had a television. We lived in a small house with a now small fenced in backyard that as a child seemed huge. In the evenings we had the fun of riding our bicycles in the street behind the “fog” truck. The wisdom of the day was to use DDT to kill mosquitoes and other summer insects. 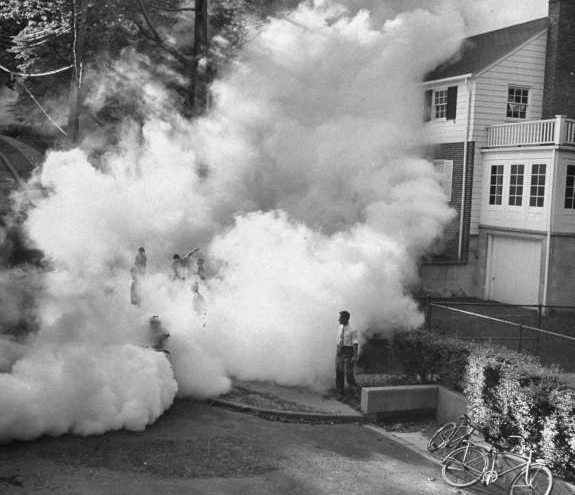 Perhaps DDT was not a poison then. So the children got a weekly unhealthy dose of a fat-soluble insecticide that fell upon their skin, and filled their lungs. Depending on the dose, such insecticides can be eliminated thru the healthy liver but are also stored in fat tissue. Many could still have the residue of such product still in their fat tissue. This storage of a toxin in the body could be viewed as a protection mechanism. Some individuals have difficulty reducing fat in the body. We could speculate that even though there could be many reasons for this, it is possible that the body will not allow fat reduction because the body may not be able to handle the toxic load that may ensue. One common principle of natural medicine is to detoxify. How often does an individual reach a stuck point in their reduction program? Some type of targeted detoxification program may help them to the next step. As a child I loved to play in the woods and the creeks. We would catch crawdads and salamanders, build dams and stick forts. The problem was that I was extremely allergic to poison ivy. It seemed all I had to do was look at it. I became an expert on identifying this plant. There are still memories of lying on a towel on the floor for my continuous application of calamine lotion. It was a good thing that my father had a drug store. I can say with confidence that I have had poison ivy on every part of my body. This allergy continued until about 15 years ago when Dr. Hinze suggested a detoxification program with to eliminate toxins from fat tissue. To my amazement, my allergy to poison ivy almost disappeared. What was happening? I suspected my body was overloaded with some toxin such as DDT. It just could not handle another insult such as the oil in the poison ivy! Spring and summer offers a wonderful opportunity to try new remedies. A great remedy for poison ivy is Rhus toxicodendron 6C, a homeopathic made from poison ivy. “Likes cures likes”. Cort-sym Gel by Natural Creations is a wonderful homeopathic to put on poison ivy. The name implies a similarity to hydrocortisone of which there is none in the product. If you are exposed, some will wash with Fels-Napha soap that may help remove the plant oil from the skin. If you get too much sun, try homeopathic Burn Repair Spray by Natural Creations. A great insect bite remedy is Insect Bite Spray by Natural Creations.